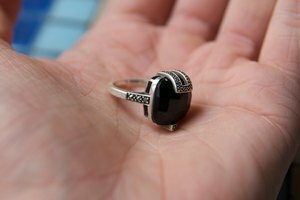 Many high school boys give their class rings to their girlfriends as a sign of commitment and affection. Most of the time, females' hands are smaller than males' so a girl may not be able to wear a boy’s ring on her finger without it falling off. While some girls opt to wear their boyfriends’ class rings on a necklace to avoid this problem, others prefer to wrap the ring so that it fits properly. Place the class ring on your finger and press down on the top of it so that you can get a visual estimate of the size of the space between the bottom of your finger and the underside of the ring. This will help you determine how thick you need to make the wrap. Tie a piece of yarn or string in a tight knot around the underside of the ring. Snip off the loose end slightly above the knot. Wrap the yarn or string around the underside of the ring, making sure to tug gently on the string with each wrap to make sure it is even and tight. Try the ring on to make sure it fits snugly and will not fall off. If the ring feels loose, remove it from your finger and wrap it several more times until you achieve a perfect fit. Snip the yarn or string off about an inch from the ring. Wrap the piece around the ring one more time and push the end of the material underneath the thick wrap to keep it secure. Use a tiny dab of super glue or nail glue on the end of the string if you cannot push the end under the wrap. If you do not want to have to rewrap the ring often, avoid getting it wet. Moisture will fray yarn and string quickly and may cause tape to unravel. For extra fun, try matching the color of the yarn or string with your outfit. Make sure the glue is completely dry before putting the ring on your finger to prevent the material from sticking to your skin.